E-mail hosting, running e-mail servers, is a service that allows businesses to send e-mails with their own domain names. For those who want more than just the POP3 e-mails, taking e-mail hosting services is the most result-oriented way to do that. WeblinkIndia, a top e-mail hosting company, gives you the peace of mind you need to focus on your business growth by taking full care of your e-mailing needs. 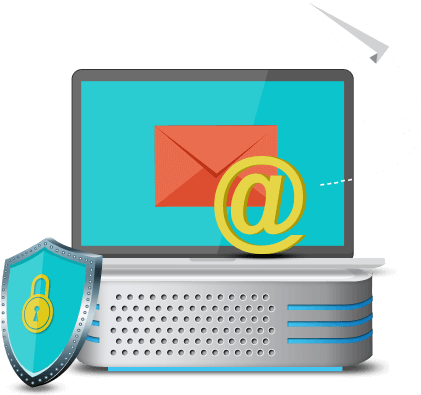 We have dedicated e-mail hosting servers that offer 100% spam-free mailing solutions that cater to all your business needs. With a simple and effective assortment of customizable webmail, e-mail collaboration, and message delivery tools in its portfolio, WeblinkIndia provides impeccable e-mail server hosting to the business setups and individuals. With WeblinkIndia, You get an option to easily access your e-mail, calendars, chats, tasks, notes, anytime and anywhere on an intuitive webmail interface. We are one of the top e-mail hosting providers that offer our clients 2GB storage with unlimited bandwidth; also, you get full support from us if you wish to increase the size of your account. Our E-mail hosting services let you synchronize your mail, calendars, and contacts with Microsoft outlook 13, Apple Mail, Mozilla Thunderbird, Apple mail, and the latest smartphones/mobile devices. WeblinkInida.net offers Industry’s best virus & spam protection that ensures 97% spam protection and mail server security, with different intrusion detection methods. Connect with your colleagues in real time with our instant messaging features that allow you to use your XMPP-compatible messenger application and connect instantly with everyone in your organization. Track your past messages and user activity with the full archiving feature of our hosting services. Our archiving feature presents companies with searchable message archiving at the system level for all e-mails/chat, and adhere to all regulatory requirements. With our e-mail hosting India, you can migrate easily from an entire domain, single mailbox, mail servers, and mail services like Yahoo!, Gmail, Office365, Hotmail, Outlook.com, windows live, etc. Why Choose WeblinkIndia.Net For E-mail Hosting? For A Successful Email Marketing: Follow These Tips!